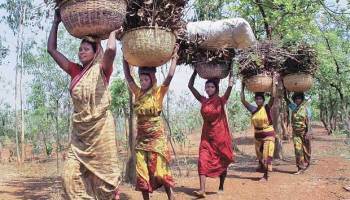 A new report, “Promise and Performance – Ten Years of the Forest Rights Act (FRA)”, released at a recent national convention in Delhi, has revealed that less than 5% of rights out of a total of over 200 million tribals and other traditional forest dwellers for about 34.6 million hectares (ha) in India has been so far recognized. The report, released as part of the Community Forest Rights Learning and Advocacy (CFR-LA) process of the convention, highlights that empowering provisions of FRA for ensuring forest rights of women are being ignored by implementing agencies. The report recommends creating a dedicated mechanism for effective implementation of FRA provisions to ensure ownership rights for women and equal participation in the decision making process for management of community forest resource (CFR) areas. The convention was held to mark the the tenth anniversary of FRA on December 14 in order to focus on failure of state institutions to recognise the rights of tribal and other traditional forest dwellers – particularly women – and examine the ongoing challenges in the implementation of FRA. Present on the occasion, Lalitha Kumaramangalam, the Chairperson of the National Commission of Women (NCW), heard testimonies on the violation of forest rights of women across states. Such stories of violence against women were echoed by other community members from across India. Testimonies from Uttarakhand revealed instances of violence by forest department officials, resulting in the hospitalisation of women and destruction of homes of villagers claiming titles under FRA. Testimonies also highlighted threats to food security posed by commercial plantations on cultivation land through compensatory afforestation and other plantation programmes. “Plantation of teak and eucalyptus by the forest department has reduced our area for cultivation. Previously we would grow 70-80 different types of millets. Now this variety has been reduced, causing a crisis in food security and nutrition,” said Basanti Majhi, a member of the Kutia Kondh community, a Particularly Vulnerable Tribal Group. Reacting to the testimonies, Kumaramangalam stressed on the need for joint titling and recognition of land and forest rights for women under FRA, while calling for systemic change in patriarchal attitudes prevailing in society. “We should be empowering women as equal partners over forests and land to ensure not only their participation but also decision making,” she said, even as ensuring the meet that NCW would investigate any cases brought forward related to the violation of women’s rights, including violation of FRA. The convention identified the Compensatory Afforestation Fund (CAF) Act, 2016 as a potential cause of violation of FRA. While FRA mandates Gram Sabha consent for the use of community forest land, the CAF Act returns to a more centralised governance framework, allowing the Central and state governments to control over Rs 42,000 crore crore, collected from industries to compensate for forest diversions. “All funds for development, reforestation, or conservation purposes should be given to Gram Sabhas. The FRA was enacted to address historical injustices against tribal and forest dwelling communities. Communities must recognize their own rights and assert these rights,” said legal scholar Usha Ramanathan.